I love stretching my legs outside! Those ears!! Aren’t they cute? Like a lot of collies, I love chasing tennis balls! Maybe I’d be good at agility? Hello! My name is Penny. I am a sweet, smart, fun loving young lady. 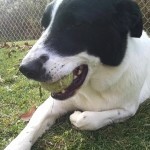 I adore tennis balls and spending time with people!! 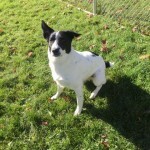 I was surrendered to a high kill shelter in KY when my family could no longer keep me. So sad in a way, but as it probably wasn’t the most loving home, maybe it was a good thing too! Especially since I avoided being put to sleep (the shelter was SO overcrowded) when Schoolhouse Rescue said they could take me into their rescue program! Whew! That was a close one! I have been living at Schoolhouse Rescue in the Binghamton area since Spring 2015. I LOVE all of the people who I have met and who visit with and take care of me. I am sretty scared (and thus not good with) other dogs and cats, which makes the rescue folks think I might have been hurt or ganged up on by pets in my prior life. I am a very sweet girl!! I love when you pet me all over. And belly rubs! Oh goodness, they are my favorite! I will roll right over for lots of belly rubs!! I really enjoy when people talk to me too, tell me I’m sweet, tell me I’m beautiful… Yep! I love it all! I really enjoy when people sit on the floor with me. I will happily lay next to them while getting petted and being talked to. 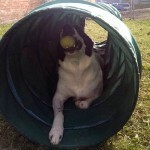 I enjoy play time with people too and love running after tennis balls!! I would love it if you wanted to stock up on the tennis balls as they happen to be my favorite toy! Interested in going for a nice walk or a hike? I’m your girl!! I am learning to walk very nicely on a leash, but I’m not a slow poke so I hope you can keep up! I do get excited when I see small animals or other dogs, so having me in a Sensation or Sensible brand harness is a smart idea. 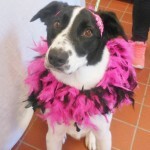 I have lots of great energy so I would make an exceptional hiking or jogging partner too! Because of my energy level, intelligence, and willingness to learn, my trainer says I would really enjoy a “job”. What type of job you ask? Well, I happen to really enjoy playing with some of the agility equipment she has brought in for us! She says I might enjoy doing tracking or competition obedience or taking agility classes, or learning flyball! All of those sound really interesting and something I might enjoy learning with a new friend—we could have so much fun together! I love every person that I meet. I am friendly, outgoing, and sweet! I have been around the 3 year old toddler who belongs to the rescue director, and was fine, but am really a bit too large and energetic to be around little kids like this. The rescue folks think kids over the age of 8 would be a nice fit for me because they could easily play with me and help with my further training. So sorry to say, but I cannot be in a home with other dogs. They scare me and I am reactive to them and make it very clear that I do not like other dogs in my space. I am getting much better around dogs in an obedience class type setting, and am fine being out on leashed walks and seeing other dogs. I have been cat tested many times and sadly, that’s a no go. I need a home with no cats or other small animals. Hanging out with you! Getting your attention! Going for walks, hikes, or jogs! Chewing on a Kong or marrow bone full of peanut butter or yogurt! Learning new skills and improving on the ones I already learned! Working on the agility equipment! I am a very healthy, active, vibrant young lady!!!! 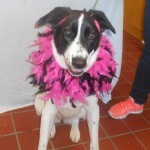 I am a sweet, wonderful soul who is looking for her perfect home. I would so like to go into an active, home with people who will appreciate my characteristics and who have some dog experience. I would LOVE people who will challenge my mind as well as keep me fit, happy, and healthy! 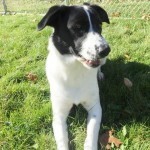 adult, border collie mix, female, large, no cats, no dogs, spayed, young. Bookmark.